As any homeowner with a wood deck knows, that deck requires a lot of maintenance. And one of the most important things you can do for your deck is to stain it each and every year. Pick a weekend without rain in the forecast. Clear everything from your deck, including furniture, leaves, twigs, needles, and other debris. Wash your deck thoroughly using a power washer. This will help remove any tough stains or debris. Examine the deck to make sure the wood is in good shape. If anything needs to be repaired or replaced, this is the time to do it. Try to avoid applying stain in direct sunlight. Instead, try and stain your wood deck in the evening. Start applying the stain using a brush, first applying heavy coats on the open-end grain of the boards. Then brush one or two boards from one end to the other using long, smooth strokes. Apply a single coat and wait for it to dry. Let the stain dry for 3 days before replacing any furniture. Remember: More stain is not always better. Over-applying stain can cause it to peel and crack. Tired of staining your wood deck every year? Well, have you considered a Low Maintenance Deck? 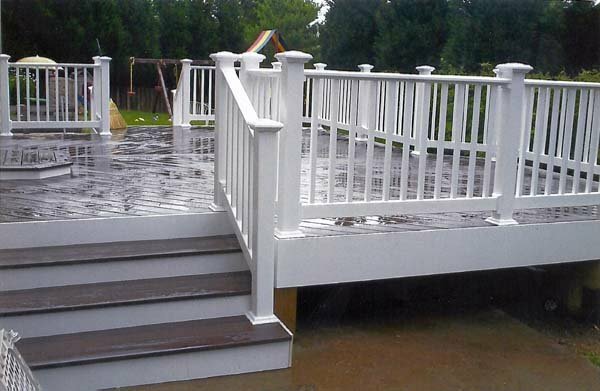 With 40 years of experience, Freedom Fence and Home has built a reputation for building the highest quality low maintenance decks for our many residential and commercial clients throughout Baltimore and Harford County, Maryland. What is a low maintenance deck? Low maintenance decking is a great way to enhance your backyard without the maintenance. The deck frame is still constructed with pressure treated lumber while the flooring and railings are PVC or vinyl. This entry was posted on Wednesday, January 23rd, 2013	at 4:53 pm	. Both comments and pings are currently closed.